Rubio, a photographer, provides some 250 color photographs of North American rattlesnakes, as well as a useful, succinct summary of what’s known about rattlesnake evolution, anatomy, and behavior. The photographs of the snakes in their natural terrains stress the perfection of their camouflage—many can coil perfectly into their surroundings. The shots also capture the extraordinary beauty and grace of these lethal (though generally shy) creatures. 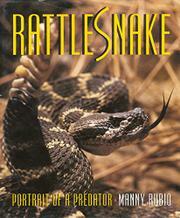 Several chapters are devoted to the impact rattlesnakes have had on American art (especially the art—and religion—of some southwestern Indian tribes) and the American imagination (there is a chapter on churches that practice the handling of rattlesnakes as part of an ecstatic communion with God). While it’s unlikely that Rubio’s work will much change the attitude of those who view the rattlesnake as a candidate for extermination, it may sway those still undecided into a more balanced, and even appreciative, view of an ancient, resourceful, and often quite beautiful species. A particularly handsome work of natural history.